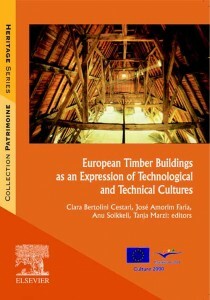 European Timber Buildings as an Expression of Technological and Tecnical Cultures – I.A.M. The development of a theoretical-practical culture of wooden construction, able to face the building tradition with the different knowledge and technical culture with technological innovation, represents a strategic research sector inside the growing interest in many parts of Europe concerning policies of development and safeguard of Cultural Heritage. supported by the General Directorate for Education and Culture. The book is organised in three sections and intends to promote and encourage the comparison and integration of cultures between the different European Countries. The first section collects experts’ contributions to the Finnish International Seminar; the second section refers to the Portuguese International Seminar; the third proposes contributions to the project from experts, with a particular attention to didactical aspects. The text intends to be a source of documentation and confrontation for architects, engineers, experts in the sector of constructions, public and private people responsible for the management of cultural heritage (i.e. National Boards of Cultural Heritage, Ministry of Cultural Heritage, Universities) and for everyone working in the didactic and research fields.